As a brief intro, EMC Storage Analytics (ESA) is a very powerful management tool, designed for VMware and Storage administrators, that can see across your EMC storage platforms to provide overall health and risk analytics. It works in the context of VMware vCenter Operations Manager. Basically what it does is provide storage metrics directly from the array via an SMI-S Provider. Of course it has all sorts of great features like integrated and customized dashboards with complete visibility into metrics and analytics. All this is done for the purpose of assisting with problem resolution. If we think about how you go about resolving a problem in the environment, basically you are doing three things – define normal, identify the problem and identify root cause. Define normal – What did my system look like when no one was complaining? What did the metrics look like? Which of the underlying components is doing something out of whack that is causing this problem? You might look at a previous day, week, month etc. Identify the problem – As an admin much of the time can be spent proving that the storage array is not at fault even if it’s performing as designed. High response time – yes it’s high because the application is sending more work down or the workload profile has changed. Storage is the last in the stack so blame gets unduly meted out there. Identify root cause – This is the last step – get to the root cause of the problem so that you can fix it, but also prevent it from happening again. ESA is going to make that a lot easier. Let’s take a quick look at the dashboards that are delivered with ESA. There are two universal dashboards and one specific to VMAX. Our first dashboard is EMC Storage Topology. Here you are going to see all the VMAX arrays you have configured (and other arrays if you have those) – we call them adapter instances. You can navigate down each array to see the underlying components – from storage groups to FE ports. ESA is also going to pull in all those related VMware objects. 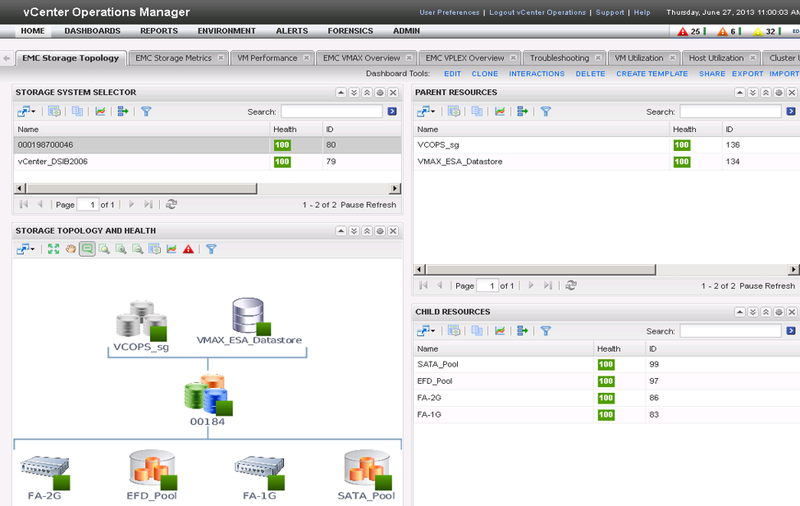 So for instance in the screen shot we can see that LUN 184 has datastore VMAX_ESA_Datastore built on it. Note too that the LUN is in multiple thin pools – the storage group happens to be in a FAST VP Policy. The second dashboard is EMC Storage Metrics. This is where all the analytics work can be done. Each EMC resource will have a set of metrics associated with it – in this example we are looking at the metrics for a storage group. Each metric can be displayed in a graph with many different options available – from combining graphs to doing historical reporting. 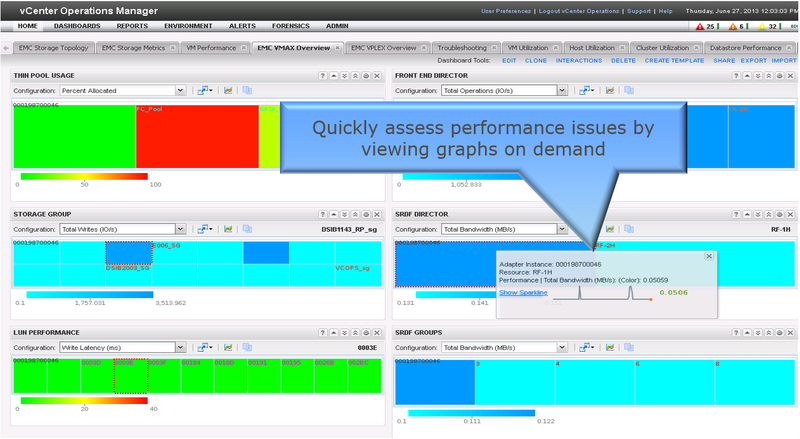 VMAX also has its own specific dashboard (as does VNX) which is done in the form of a heatmap – EMC Performance Overview. This dashboard will cover the main resource types – thin pools, storage groups, LUNs, FE and SRDF directors, and SRDF groups – and provide a few metrics from each one. The heatmap colors work on two different levels – there is a green to red legend for some which represents either usage (e.g. thin pool allocation) or performance (e.g. latency) and there is a blue legend for relative usage across that metric within an array (e.g. total writes). From this dashboard a quick graph of a particular object (e.g. SRDF director) can be generated or using the icons you can navigate to the metrics page to get a full historical perspective of the metric values for that object. So that’s ESA 2.0! Look for it soon! See this demo (and many more) and discuss with the experts in the booth what it is and how it can help you. Hi Cody.. I have installed ESA 2.1 .. i am trying to remove it now.. how would I do that? The trial key is taking too long to obtain and we have EMC SRM in house. This is Drew – I wrote the blog entry. There is no uninstall capability for ESA. What we recommend is removing all the adapter instances and their associated objects. That will stop any collection. The adapter kind (EMC Adapter), however, will remain available. My company is currently trialing ESA, it looks like there are no metrics being collected for vmax backend directors. Do you know if there is any plan to add this capability, or is there a way to start collecting stats for backend directors manually? There are currently no plans to add back-end director metrics. 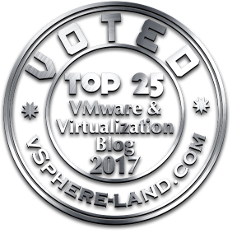 These metrics have not been seen as essential for the VMware administrator who is the target of ESA. You are welcome to submit an enhancement request either through an SR or your EMC sales contact. Outside of ESA, you can collect back-end metrics through the Solutions Enabler CLI (storstpd daemon) or GUI interface via Unisphere for VMAX which would be the preferred methodology. Just as an FYI, Cody now works for Pure Storage so I’ve moved the EMC past and future posts to drewtonnesen.wordpress.com. Here is the most recent ESA post: https://drewtonnesen.wordpress.com/2014/12/11/emc-storage-analytics-3-0-and-vrops-6-0/.